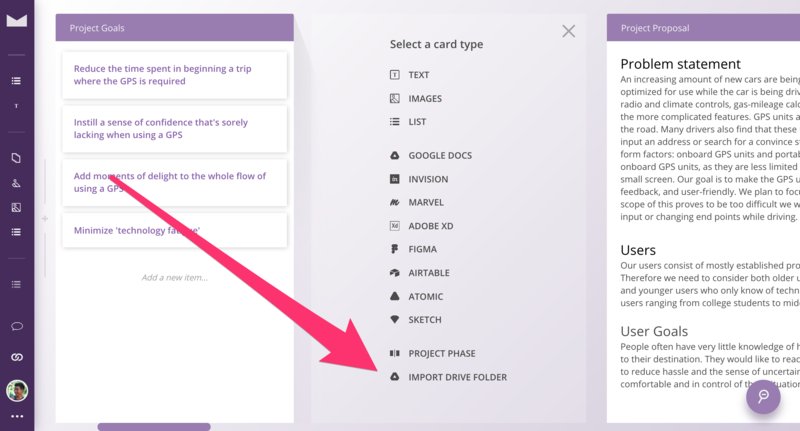 Purple allows you to select a folder from your Google Drive, and it will import any files that we support into a bunch of Google Docs cards. This includes Docs, Sheets, Slides, Forms, and PDFs. To import, click on the New Card Menu, then click "Import Drive Folder" at the bottom. Your files will be imported into a Card Stack. If you prefer them laid out side by side, you can always break apart the stack in the Card Menu. Just a note - importing a Drive folder is a one-time import, not a continuous sync operation.